Two more very important words contain the root that we are studying here, namely universe and university, and their Spanish cognates, namely universo and universidad. These words are derived from the Latin nouns ūnivĕrsum ‘the whole (world)’ and ūnĭvĕrsĭtās ‘the whole (entirety)’. Both of these nouns go back to the Latin adjective ūnĭvĕrsus, which meant ‘all together, all in one, whole, taken collectively’, and its feminine nominative wordform was ūnĭvĕrsa and the neuter ūnĭvĕrsum, e.g. universa provincia Babylonis ‘the whole land of Babylon’. This adjective was a compound formed with the root ūn‑ of the numeral ūnus ‘one’ and the participle vĕrsus ‘turned’ that we have seen in this chapter, with the linking vowel ‑ĭ‑ added in between (ūn‑ĭ‑vĕrs‑us). Thus, this adjective meant literally ‘turned (into) one’. From this adjective, the adverb ūnĭversē was derived which meant ‘in general, generally’. The phrase in ūnivĕrsum had the same meaning as the adverb. Lat. ūnĭvĕrsus is equivalent to Ancient Greek κᾰθολῐκός (katholikós) which also meant ‘general, universal’. From this Greek word come the cognates Eng. Catholic and Sp. católico. This Ancient Greek word was borrowed into Late Latin as catholicus and became part of the name of the (Christian) Catholic Church, which aspired to be universally applicable to all of humanity, and hence the name (cf. Lat. Ecclesia Catholica; Sp. Iglesia Católica). Gk. κᾰθολῐκός (katholikós) is formed from the adverb κᾰθόλου (kathólou) ‘on the whole, in general; etc.’ and the adjectival suffix‎ ‑ῐκ‑ός (‑ik‑ós). The adverb κᾰθόλου is formed by the prefix κατά (katá) ‘downwards, etc.’ (also an intensive prefix) (cf. catalog, catapult, cataract, catastrophe, etc. ), and ὅλου (hólou), genitive wordform of the adjective ὅλος (hólos) ‘whole, all’, a cognate of the patrimonial English word whole. From the neuter form of the Latin adjective ūnivĕrsum, a converted (zero-derived) noun was derived in Latin meaning ‘the whole world, the universe, all people, everybody’. Also, from the plural masculine form ūniversī was used with the meaning ‘the whole body of citizens, all men together’. Eng. universe [ˈju.nə.vəɹs] seems to have been borrowed from both French and Latin by different authors at different times, not just once. It first appeared in the late 16th century with the meaning ‘the whole world, cosmos, the totality of existing things’. The noun is attested earlier in the century in Old French as univers, a loanword from Lat. ūnivĕrsum, though it was used earlier in the phrase en univers, calqued from the Latin phrase in ūnivĕrsum, and the now obsolete adjective univers meaning ‘whole’ from Lat. ūnivĕrsus is attested already in the 13th century. According to Corominas, Sp. universo shows up in Spanish a century earlier than in French, in the first half of the 15th century, in 1438 to be exact, in a book titled El Corbacho o Reprobación del amor mundano, a misogynistic invective against earthly love and lust by Alfonso Martínez de Toledo, archpriest of Talavera de la Reina (Toledo). Also from the same period are Catalan univers and Portuguese universo. The earliest attested word that comes from this Latin word in the modern languages is Italian universo, from the early 14th century. Lat. ūnĭvĕrsus was an adjective but perhaps because the noun ūnĭvĕrsum was derived from it without any additional morphemes, at a later date, in the post-Augustan period, Latin derived an adjective from the noun ūnivĕrsum by means of the third declension adjectival suffix ‑āl‑, namely ūniversālis (ūnivers‑āl‑is), meaning ‘of or belonging to all’. This adjective was borrowed into English and Spanish as universal in both cases, since Latin adjectives in ‑āl‑ always lost the inflectional endings in patrimonial Spanish and French words and hence they did in words borrowed from Latin as well, by analogy. In English, universal is pronounced [ˌju.nə.ˈvɜɹ.səl] and in Spanish [u.ni.βeɾ.ˈsal]. Although in Latin, the stress of adjectives in ‑āl‑ went on this suffix’s vowel, like in Spanish, in English, the stress was retracted to the preceding one. The primary meaning of this word in both languages is ‘relating to or done by all people or things in the world or in a particular group’, ‘applicable to all cases’ (COED). The adjective universal is attested in English even before the noun universe, namely in the late 14th century. It was a borrowing from French universel, a loanword from Latin, first attested in the 13th century. In Spanish, universal first appears in the same source as the noun universe, namely in the 15th century. Both English and Spanish, along with French, have derived other words from the basic noun Eng. universe ~ Sp. universe. One of them is ver verb Eng. universalize ~ Sp. universalizar, meaning ‘to make universal; generalize’ (AHD), cf. Fr. universaliser. It is not clear in which of these three languages the verb appeared first, though it seems it may have been in English, in the middle of the 17th century. The suffix ‑ism‑ has also been added to the adjective universal to produce relatively uncommon words that mean primarily ‘the fact or condition of being universal in character or scope’ (SOED). The term has been used in philosophy and theology to refer to the belief in ideas of universal applicability. In English, however, universalism also came to refer to ‘a [Christian] theological doctrine that all human beings will eventually be saved’ (MWC) that appeared in the late 18th century in the US. In the Spanish world, universalismo has been used to refer to a political doctrine that defends the unification of states. Related to these nouns, as usual, are the adjectives Eng. universalist ~ Sp. universalista. The first Western European university arose in Bologna (Italy) in the late 11th century, the second one in Paris (France) in the mid-12th century, and the third one in Oxford (England) in the late-12th century. In Spain, the universities of Palencia and Salamanca date from at least the early 13th century. The University of Salamanca’s claim to fame is that it was the first one to be officially called a university, by royal decree, in 1253. The words university and universidad words are derived from the Latin term ūnĭvĕrsĭtās ‘the whole’, or more accurately from its accusative wordform ūnĭvĕrsĭtātem. This word is formed, in Latin, from the stem ūnĭvers‑ that we have seen and the noun-forming derivational suffix ‑tās (regular morpheme: ‑tāt‑) plus the linking vowel ‑ĭ‑. This suffix was added to adjectives (or sometimes nouns) to form abstract third declension feminine nouns indicating a state or condition. The reason that the accusative form of this word was used is that patrimonial Latin words with the suffix ‑ĭtās descended into Spanish and French through their accusative wordform, which in this case ended in ‑ĭ‑tāt‑em, an ending that in patrimonial words changed to ‑edad and in learned words to ‑idad in Spanish and to ‑ité in French (English ‑ity comes from Fr. ‑ité). When additional words with this suffix were borrowed from Latin later on, the original ending in the Latin word was replaced with the patrimonial suffix we just saw. So, how did universities get their name? The Latin word ūnĭvĕrsĭtās, which originally just meant ‘the whole’, came to be used for ‘a number of persons associated into one body, a society, company, community, guild, corporation’ (L&S), a meaning similar to the one Lat. collēgĭum had (see §8.4.5.4 below). 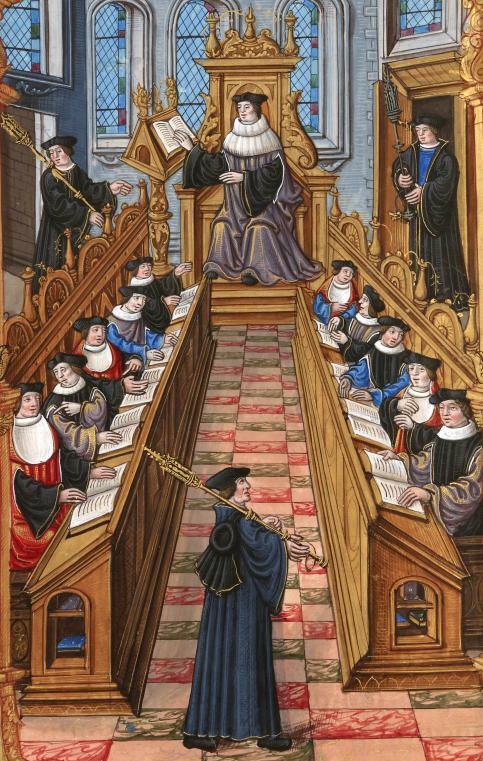 So, when these new centers of learning were created, which were nothing more than guilds or corporations of teachers and of students, they were called, in Latin, ūnĭvĕrsĭtās magĭstrōrum ‘guild of teachers’, ūnĭvĕrsĭtās schŏlārĭum ‘guild of students’ or, putting the two together, ūnĭvĕrsĭtās magĭstrōrum et schŏlārĭum ‘guild of teachers and students’. It was a matter of time before these terms were reduced to universitas, a term which was then adapted to the local languages by changing its ending to the ending Latin words ending in ‑itas typically took, namely ‑ity in English and ‑idad in Spanish, giving us Eng. university and Sp. universidad. The model of the European university has spread to the whole world but universities have also changed much in recent times. The focus of learning has shifted in the last 200 years from learning Latin and the seven liberal arts—grammar, logic, rhetoric, geometry, arithmetic, astronomy, and music—that resulted in students then joining one of the three professional faculties, namely medicine, law, and theology. Nowadays, a university is simply ‘an educational institution at the highest level, where you study for a degree’ (DOCE). More specifically, in the English-speaking world, universities confer post-graduate degrees and thus contrast with colleges, so one dictionary defines the word university as ‘an institution for higher learning with teaching and research facilities constituting a graduate school and professional schools that award master’s degrees and doctorates and an undergraduate division that awards bachelor’s degrees’ (AHD). Other dictionaries emphasize the fact that research is done at these institutions, e.g. ‘a high-level educational institution in which students study for degrees and academic research is done’ (COED). In the preceding section we mentioned cognates Eng. college ~ Sp. colegio. These two words are typically false friends since Eng. college is typically a type of universidad in Spanish and Sp. colegio typically refers to private primary school. Actually, the situation is a bit more complicated. 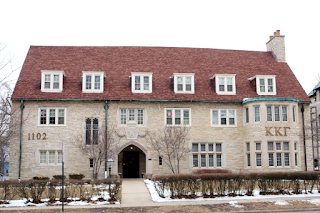 In Spanish, the word colegio used to have the same meaning as college did in English originally since it was used to refer to a community of people who lived in the same residence hall, which was destined for the study of sciences, arts, or trades under some kind of authority and rules. Nowadays, however, Sp. colegio has come to refer primarily to an elementary and sometimes secondary school, though this word is more common in some countries than others and it competes with the word escuela, especially when talking about public schools as opposed to private ones. (Note that in Britain, the word public school refers to private schools.) Also, the meaning of the word colegio varies somewhat from place to place and from time to time. Today, for example, colegio is not used in Spain anymore for the equivalent of high school, for which instituto is preferred. The Latin word collēgĭum was also used in Medieval times to refer to societies or corporations of people in the same profession or trade. Sp. colegio is still used with that meaning in a number of expressions such as colegio de abogados, equivalent to bar association in English, and colegio médico, equivalent to doctors’ associations in the English-speaking world. In the Catholic Church, the terms colegio de los obispos or colegio episcopal are used to refer to collection of bishops who run the Catholic Church. 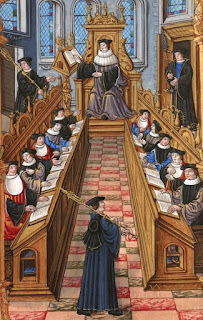 This is one case in which the English word college has retained its old meaning since such a bishop group is referred to in English as college of bishops. In English too, the word college has retained in a number of expressions this archaic meaning, namely ‘an organized group of professional people with particular aims, duties, and privileges’ (COED). Thus, in the US, it is used in the term electoral college, which is ‘a body of electors chosen to elect the President and Vice President of the United States’ (AHD). The Latin word collēgĭum was derived in Latin from the stem collēg‑ of the noun collēga ‘partner in judgeship or other office, colleague’ and the suffix ‑ĭ‑um, a suffix used to derive abstract nouns, sometimes denoting offices and groups of people (collēg‑ĭ‑um). (The noun-forming suffix ‑ĭ‑um is derived by conversion from the neuter form of the first-second declension adjectival suffix ‑ĭ‑us/‑ĭ‑a/‑ĭ‑um.) As for the Latin noun collēga, it is the source of Eng. colleague [ˈkɒ.liɡ] and Sp. colega [ko.ˈle.ɣa]. It contains the prefix con‑ ‘with, together’ and the root lēg‑ of the verb lēgāre, which meant primarily ‘to send with a commission, send as ambassador, depute, commission, despatch’ and ‘to bequeath, leave by will’. This verb is derived from the regular root lēg‑ of the noun lēx (genitive: lēgis; regular root: lēg‑) ‘a formal motion for a law’, which is the source of the cognates Eng. law and Sp. ley ‘law’. The fact that people in a collēgĭum followed the same rules and laws may be another reason for the meaning this word took in Medieval Latin, namely that of ‘residence of scholars’. Eng. colleague and Sp. colega have very similar meanings, at least in theory, since they both refer to ‘a person with whom one works in a profession or business’ (COED). In practice, however, they are not used in exactly the same way. Spanish colega is used almost exclusively among people in the liberal professions (Sp. profesiones liberales), much more so that Eng. colleague is, which can be used to refer to an person that one works with. (A liberal profession is ‘an occupation that needs a high level of education and training’, such as doctors and lawyers.) On the other hand, Sp. colega is also used in some dialects of Spanish in colloquial slang with the sense ‘buddy, companion, comrade, pal’. There are a few other interesting words derived from the stem collēg‑ĭ‑ of Lat. collēgĭum. From this word, Latin derived the adjective collēgĭālis with the adjectival suffix ‑āl‑ (collēg‑ĭ‑āl‑is) that meant first of all just ‘of a collegium (guild/fraternity/board)’, but which acquired additional meanings through time. Eng. collegial, pronounced [kə.ˈli.ʤɪ.əɫ] or [kə.ˈli.ʤəɫ], is a mid-14th century loanword from French. Its main meaning today is probably ‘marked by camaraderie among colleagues’ (MWC), though it has other senses, such as ‘relating to or involving shared responsibility’ (COED). The first of these meanings translates into Spanish as de colegas or de compañeros and the second one as colegiado (see below). The cognate of Eng. collegial in Spanish is colegial, a false friend, for this is an adjective of the noun colegio ‘primary and secondary school’, and thus it means ‘of a colegio, related to a colegio’. In addition, colegial has been turned into a noun in Spanish with the meaning ‘schoolboy, a child that attends a colegio’, which is the most common meaning of this word today. The feminine form is either colegial or colegiala ‘schoogirl’. Also derived from colegio is the noun colegiatura can be used to refer to an admission or scholarship in a school in some dialects of Spanish (beca o plaza de colegial, MM), though in Mexico, it means ‘school fees’. English derived the noun collegiality from the adjective collegial in the late 19th century, which now means primarily ‘cooperative interaction among colleagues’ (RHWU), though it is also used with the sense ‘shared power and authority vested among colleagues’ (AHD). The former meaning translates into Spanish as camaradería or compañerismo. Spanish has a cognate of the noun collegiality, namely colegialidad, which is used with the meaning ‘quality of an association that is organized as a colegio or a corporation’ (DLE). Another word derived from collēgĭum in Latin was collēgĭātus, which is formed with the suffix ‑ātus (fem. ‑āta), which in addition to being the regular passive participle ending of first conjugation verbs, could also be used to form adjectives from nouns indicating the possession of a thing or a quality. From such adjectives, nouns could also be derived. That is what happened with Lat. collēgĭātus which came to mean ‘member of a collēgĭum (society, college, corporation)’. The descendants of Lat. collēgĭātus are Eng. collegiate and Sp. colegiado, but their meanings are very different. Eng. collegiate is an adjective that means ‘relating to college or a college’ (DOCE) and thus translates as universitario in Spanish, e.g. collegiate sports (Sp. deportes universitarios; intercollegiate = interuniversitario). Sp. colegiado (fem. colegiada) is, first of all, an adjective that means ‘constituted as a colegio (society, college, corporation)’. Additionally, it can be a noun that refers to a person who is a member of a colegio in the professional, not school sense. Most commonly this word is used in soccer, where it means ‘a referee who is a member of an official referee association (colegio de árbitros)’. Sp. colegiado can also be the past participle of a verb colegiar(se) that Spanish has developed out of the noun colegio. This verb means simply ‘to form a professional colegio’ and ‘to become an official member of a professional colegio’. From the past participle colegiado of this verb comes the adjectival sense of this word, ‘that has joined a professional colegio’, as in médico colegiado ‘a doctor who is a member of the professional association of physicians’. A tribunal colegiado is a court of justice containing three or more judges. There are many words derived from this Latin verb, starting with Sp. legar ‘to bequeath, hand down, pass down’ and from it, Sp. legado (cf. Eng. legacy), and the cognates Sp. delegar ~ Eng. delegate, Sp. relegar ~ Eng. relegate, and Sp. alegar !~ Eng. allege (the ! indicates that they are false friends). By the way, the word collēgĭum is formed on the same pattern con‑X‑ĭum that produced convīvĭum ‘a meal in company, a banquet, a feast’, formed with the root vīv‑ of the verb vīvĕre ‘to live’ (source of Sp. vivir). Literally, it means ‘a living together, a co-living’. Another word formed on this patter is condominĭum ‘co-ownership, owning together’, from condŏmĭnus ‘co-owner’, from dŏmĭnus ‘master, possessor, ruler, lord, proprietor, owner’ or the verb dŏmĭnāre ‘to rule, control, dominate’. Lat. dŏmĭnus meant ‘the Lord’ in Christianity and it is also the source of patrimonial Sp. dueño ‘owner’. All of these words are derived from the word dŏmo ‘house’. Eng. condominium [ˌkɒn.də.ˈmɪn.ɪ.əm] was borrowed from Latin in the early 18th century with the meaning ‘joint rule or sovereignty’. It acquired the meaing ‘privately owned apartment’ in American English in 1962 and it was soon abbreviated to condo [ˈkɑn.doʊ̯]. This use of the word translates into Spanish as piso or apartamento. In politics, the word condominium in English means ‘the joint control of a state's affairs by other states’ (COED) and this sense of the word does translate as condominio in Spanish.